This weekend was the 5k to support breast cancer research. I hate that I had one more reason this year to participate. I have a friend, a former co-worker, that has been generously passing her daughter’s clothes down to me. They are the cutest styles and I am having such fun dressing my daughter. Well, a couple of weeks ago she emailed me that she had another bag of clothes to drop off and hoped to come by soon since she just found out she was in the early stages of breast cancer and was going to be having a double mastectomy the same week. Wow! How do you respond to that? I wasn’t so sure but I graciously accepted her clothes and felt compelled to do something. 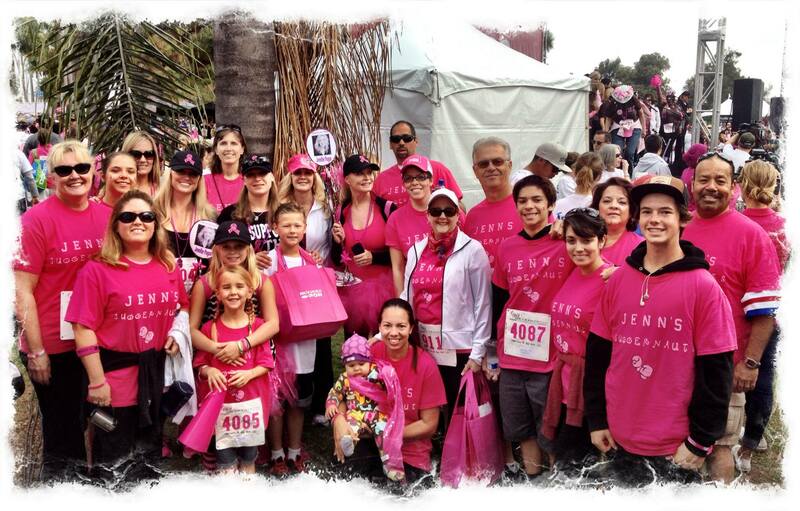 So, when I got an invite to join the walk against breast cancer I added my name to the team Jenn’s Juggernauts. Jenn was a college friend who died in 2010 from breast cancer leaving behind 3 young kids and husband. I also have an aunt who is a survivor.